VIENNA, Ohio — Team members from multiple Millwood Inc. locations across in the country, including the corporate office here, traveled to Fremont, Neb., to assist residents after a storm and flooding left nearly 600 homes uninhabitable. In March, a “bomb cyclone” hit the central United States, with hurricane-like winds and blizzard conditions leading to heavy rains and flooding. In Fremont, which sits about 40 miles northwest of Omaha, levees failed along the Missouri River, leading to record flooding that surrounded the town, reported The New York Times. Millwood associates from locations in Apple Creek and Dundee, Ohio, Alburtis and Mechanicsburg, Pa., and Waterford, N.Y., left for Fremont on March 29 as a part of Operation Blessing International, a nonprofit humanitarian organization based in Virginia Beach. The group cleaned mud and muck from basements, tore down drywall and built relationships with Fremont residents, according to a release. 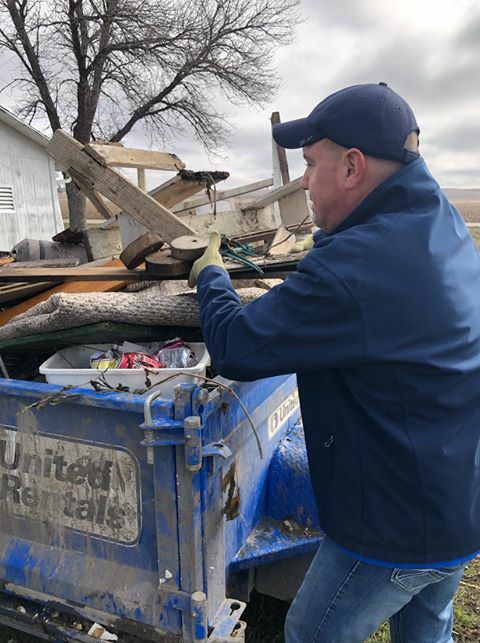 Dwayne Trafka, regional operations supervisor at Millwood, loads debris into one of the dumpsters that lined the road. The trip was sponsored by Millwood Cares, a company program that assists employees with professional, personal and spiritual growth, she said. Employees spent a week in Fremont, completing three to five houses daily. The team finished 19 work orders before returning home April 7. Pictured above: Volunteers from Millwood included Jose Perez, Brian Paul, Doug Grandison, Jody Jones and Elizabeth Martinez.